To apply for services please go to the "Application" page, fill out the short questionaire and submit it. I will contact you as soon as possible to further discuss your needs. Here at Deb's Doggercise we only use Force Free, positive reinforcement methods to teach your dog. We will never use any aversive tools or methods when handling your dog. Anyone can STOP a dog from presenting a negative behavior through force, fear, and coersion...but an educated, skilled trainer will teach your dog what TO DO with compassion and understanding. We offer several training options to fit you and your pups needs. 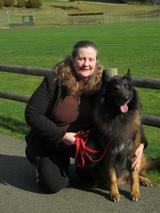 All training is done in your home, or out and about in our community, based on the level of trainng your dog needs. Please go to the "application" page and submit the brief application, send an email to deb@debsdoggercise.com, or call (843)903-5530 for training assistance.